I shot one of the coolest weddings at Rise Hall in Yorkshire during the summer. Rise Hall is owned by Sarah Beeny of Property Ladder fame and it's such a great venue to shoot at as it's been specifically set up to be a wedding venue and Isabelle & Paddy loved the building and architecture. Which is great for me, as I didn't need to worry about moving furniture or damaging family heirlooms....not that I normally do. So anyway back to this shot. I sometimes like to set up one final shot at the end of the night, as it's a great way to be really creative and give my couples something different. It's also really nice to say goodbye and wish them luck when they are on their own with me and not in the middle of a dance floor. I knew that Rise Hall didn't have any flood lights at the front of the building, so not many people would have seen it at night and there certainly would not be any night time shots of it. 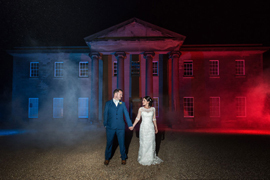 So using my 'Grand Master Flash' skills I set up a couple of lights to light the building with a red and a blue gel. I also added a bit of photography magic with the smoke. We ended up with a totally unique photo for Isabelle and Paddy of them on their wedding day that they love. To see all the images from one of my favourite couples click this link.